A locksmith is a professional service provider whose significance cannot be overstressed upon. A professional locksmith is the only one can provide security essentials to our homes and offices. We need locksmiths countless times in our lives. The best way of getting a locksmith in an emergency situation is by hiring a personal locksmith. This ensures his availability and dedication to our needs every time we are in a critical situation. While we want to hire a locksmith for our needs, have we assessed what kind of services he provides? A locksmith provides countless services, some of which are unknown to us. Let us have a look at the common and unique services provided by locksmiths only and how they are significant to all of us. Opening locks in emergencies: if you’re heading to your office in a hurry and suddenly you cannot find your car keys, only a locksmith can help you out. A locksmith will be available at your service no matter what time of the day or night it is. He will make sure he opens your car locks in an instant so you are not late for work. In other cases, if you are locked outside your home and you cannot find the keys to your main door, a locksmith will make sure you get in before you even know it. He will open your door’s lock within a matter of minutes without damaging or breaking the door. Repairing and installing: locksmiths are also available to repair your locks if they have been broken or damaged. A locksmith is skilled to repair any kind of lock that has been installed in your home or office. Any lock or security system that has gone awry and requires maintenance can be taken care of by a professional locksmith. Similarly, a locksmith can also install a new lock in your house. If you think the old lock cannot possibly be suitable for security, you can have a new lock or electronic security system installed. And if something goes wrong with the system, the locksmith will have it fixed in an instant. New keys: if you require more than a single key for your house’s door because you lose them so often, you can have a locksmith make one for you. A locksmith has the right kind of materials and technology to create a new key exactly duplicate to the one you provide it with. You can have spare keys inside your bag in case you lose the first one. Security systems: what most of us might now know is how professional and trained locksmiths can install high-tech security systems in houses and offices. If you think you need high-tech security like the ones in banks, you can have a locksmith install the system for you. A trained locksmith will ensure that the system cannot be breached by a common rookie and the locks cannot be picked. Garage security systems: if you think your garage may have an old lock that can be broken easily, you can have a locksmith install a new one right now. A professional locksmith will install the latest garage lock to keep your automobiles safe. If you have an old lock which is extremely reliable but has rusted, you can have the locksmith repair it and maintain it to make it fit for use. Whether you want your garage door locks to be fixed or your main gate doors to be maintained, a locksmith is who you need. Services in banks: locksmiths are also trained enough to provide services in banks. These services include installing locks for vaults, safe deposit boxes and other equipment required in banks. These are all essential services required in banks and emergency safety buildings. Without locksmiths, all these essentials services would not be availed. These are some of common and unique services provided by locksmiths. These services are undeniably significant in our homes, offices and other places. All of us are in need of our personal professional locksmiths which can be called upon emergency situations. We need locksmiths in our lives to make our lives easier. 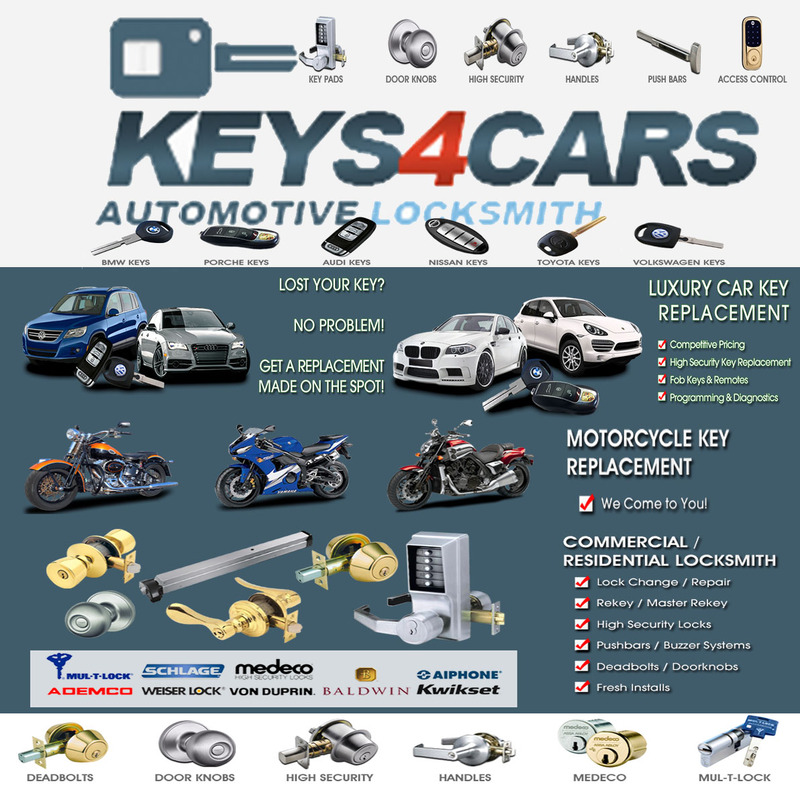 Locksmiths will be available on our emergency calls to get us keys and repaired locks instantly.